In my watercolor split group, we've been talking about classes a lot - the crafting community loves to learn. I have taken a ton of online classes in the last few years. It's amazing how much is out there. I love Online Card Classes for crafty classes. As a matter of fact, there's a new one coming up - all about shiny things - check it out. I am taking a watercolor class right now on the Jeanne Oliver site. And Creative Live has some photography tutorials I want to take - that's something I have wanted to make time for and just haven't done it. I love that they have free classes so you can try before you buy. They even have ones geared towards Instagram panoramas etc. So much to learn, so little time. One of the things in the watercolor class I'm taking though is experimenting with different kinds of washes to get the effects you want - like clouds, or fields, etc., so I've been playing with washes a LOT. I thought it would be fun to use mini washes in the hexagons from Honey Bee's Sweet as Honey stamp set as a color wash experiment. I knew I could get a fun, colorful abstract look for those and the jars with some no-line watercolor. I love how bold and warm it all turned out. Isn't that a fun way to play with mixing colors? It was such a relaxing painting session. And of course I did a video for you - I always feel bad if I don't make a video when I watercolor, by the way. You know I love you! 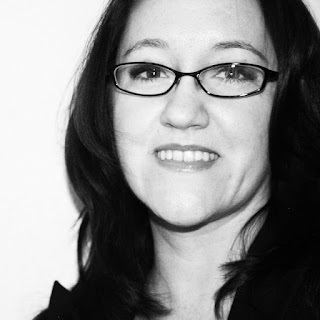 So I'm playing along with a blog hop today with them and the MISTI design team peeps - who you all know and love! 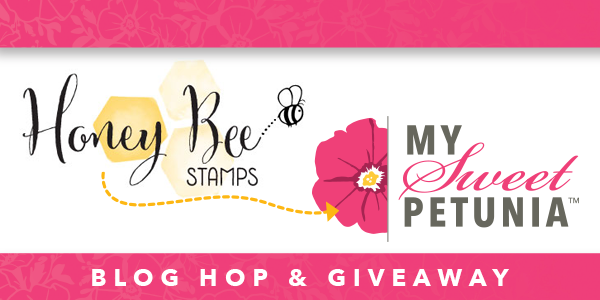 Be sure and leave comments everywhere for your chance to win some Honey Bee and My Sweet Petunia goodies! My Sweet Petunia will be giving away a mini MISTI, and Honey Bee will be giving away a $45 shopping spree. Terrific card! I love how you tied the colors together in the honey pot and hexagon honeycomb images. What fantastic images too. Thanks for the video. I love to watch you watercolor. Simply stunning! Love that Maddie bat! (Also happy to learn how to pronounce "Quinacrodone"...may be misspelled here!!! It is not in my dictionary!!) Hugs!! Love the watercolor look you created! The colors are gorgeous! It's great that Maddie checks to make sure your using the right colors and she even makes sure your camera angle is correct, what a great helper! I always enjoy your videos and I love this card! Your choice/combo of colors is beautiful! How cute is this!!! Love all the pretty colors too! Great card. Thanks for sharing your ideas with the rest of us. Love the watercolor effect on your card. Great way to experiment. Love the watercolor, the next thing I need to learn! Please enter me for the wonderful giveaway. Love your card and the watercolor washes. We keep bees so I am drawn to honey/bee images. Your watercoloring is fabulous....Love these bright colors.....Sweet card! Lovely card. It welcomes Spring. Thanks for the tip about leaving the negative space in the MISTI...beautiful watercoloring! Love the vibrant color combinations. So pretty! Very cool how you explained and showed the no-line watercolor. You make it look easy. The card is very cute. I love how the colors blend into one another. Your use of color is both inspiring and intimidating lol. I love how you add 'movement' to an image with colors. The honey jar and the hexagons (?) are beautiful. Lovely watercolor project. I have this stamp set and you've inspired me to try different mediums with it. This is a cool technique. I like the colors you chose. Thanks. This is both challenging and inspiring. Thank you for a lovely demo. Gorgeous card...love the colours and how you created it. I love-love the way your washes came out! Pretty card! Love the water coloring. This is super cute, love the wonderful watercoloring. You are so talented and so generous! I told the man from HFC you inspire me. Love these vibrant colors! So cute, love the watercolor look. I love the variation of colors in the shapes and the bar is perfection! It does look like it was fun to make! Love your card and you! Love your pretty card. Thanks for the video. This is stunning! Love watching you watercolor! Absolutely adorable Lydia. 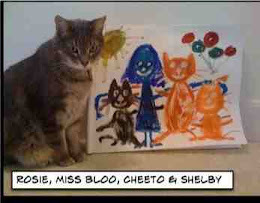 A great lesson in water colouring. TFS! Oh my gosh! I ADORE your card! I have watercolors and haven't the faintest idea what I'm doing with them. I can't wait to watch your videos! Great video! I do like watching different watercolor techniques! And a cute card! 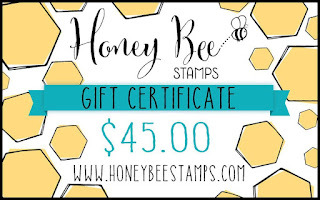 Love the color wash. Honey bee has great stamps. Love the "washy" loose water color effect that you used. And that stamp set is really sweet! Will have to check out the company, since they are a new one to me. Stunningly unique and gorgeous. This is definitely my kind of watercoloring. I like the idea of using a bit of each color in your hexagons. That turquoise is my all-time favorite, too. Thanks for the good instruction and idea. Love the water coloring! Beautiful card! I have no words to express how much I love card. I am a bee lover too, and your color choices and placement are amazing! Thank you for sharing about online classes and how some have free trials and love your card!!! Thank you for sharing tips on no line water color! I need to dive in and try it! Oooooh, how stunning! I love this beautiful watercolour effect, and your colours are mesmerising! Love the card! The water coloring is so soft and sweet. ANd love the mixed colors, beautiful! Beautiful watercoloring! And it is always fun to see your kitty! What an innovative way to use the stamp. You inspire me to pull out my watercolors and try! You have wonderful skills. The colors dried so beautifully. 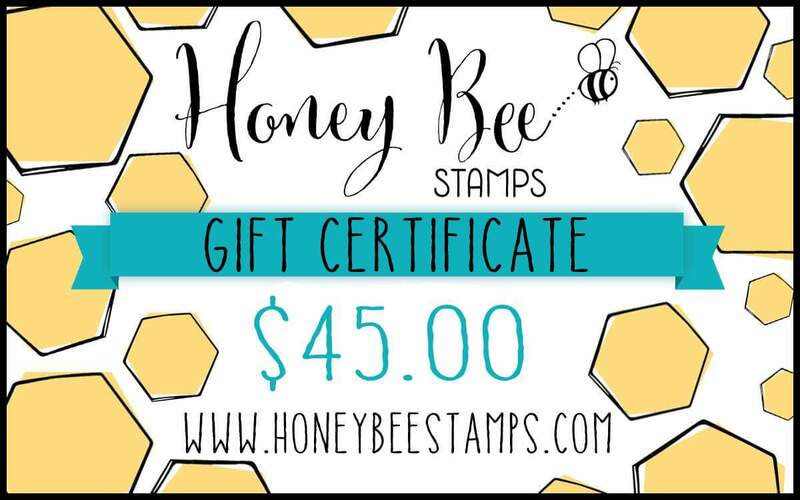 Honeybee makes great stamps. I have Zen Florals and use it all the time. Love your water coloring. Nice card! Love your color washes. It never occurred to me to practice washes. Thanks for the idea. Thank you so much for the video on no line watercoloring. I learned some new things from you. Your design is beautiful. Beautiful painting, Lydia! Thanks for sharing your process! Wow! Love your card and the technique you used! Adorable card. Looking forward to watching your video. Watercolor is such a mystery to me! I love the mixing and blending of the colors. Very pretty. This card is so pretty! Love the variation you got in the color with the watercolor - you are so talented! I love how the hexagons turned out. It was amazing to watch. The card is really cute. Darling card Lydia. Love the pretty and vibrant colors. The honey pot looks amazing. Great ideas, great stamps. Way to go! This card is beautiful. I absolutely love the watercolors. This is so pretty! Love the watercolors! How fun! You definitely have taken watercoloring up a notch on this card. VVVERRRRY nice. I enjoyed watching you paint and your combining the different colors....interesting. I really love this look! Great job! Love the no-line colouring Lydia. We definitely need a lot more bees in the world. I love taking photos of bees on flowers going about their business. Hi! Love your card and the watercolor effect. Have to give it a whirl. Thank you for the great video! I love the water coloring you did! Thank you so much for the inspiration! Just wow! I love your project! Thank you so much for the inspiration! This is so pretty! Love your colouring! Your watercolouring looks awesome! You are sooooo right...too little time. Really cool cad and great coloring! I really love this idea and I can't wait to try it myself! The watercolor honeycombs are so pretty! Love your card. Thanks so much for including the video. They are so helpful, plus then we get to see your adorable cat. Love the coloring of the hexagons. Love the colors in the honeycomb. So awesome!!!!!! And the way you colored it! Fabulous watercoloring!! Love the hexagons!! I loved watching you try all your new colors. When you started mixing all of them in each hexagon, I was worried you would get mud, but it turned out fantastic! I love your work!This is such a fun technique with great results! Thank you for sharing your card and video. I am new to card making, and haven't tried watercolor yet. It is very nice blends of colors. Love it! I will have to try it when I have a chance! Great tutorial to learn how to paint with Watercolors. Thanks! Oh my goodness!!! Such a gorgeous card!!! Love it!!! This card has the most lovely color combinations. I also love watercoloring, Online Card Classes, and Honey Bee Stamps!!! 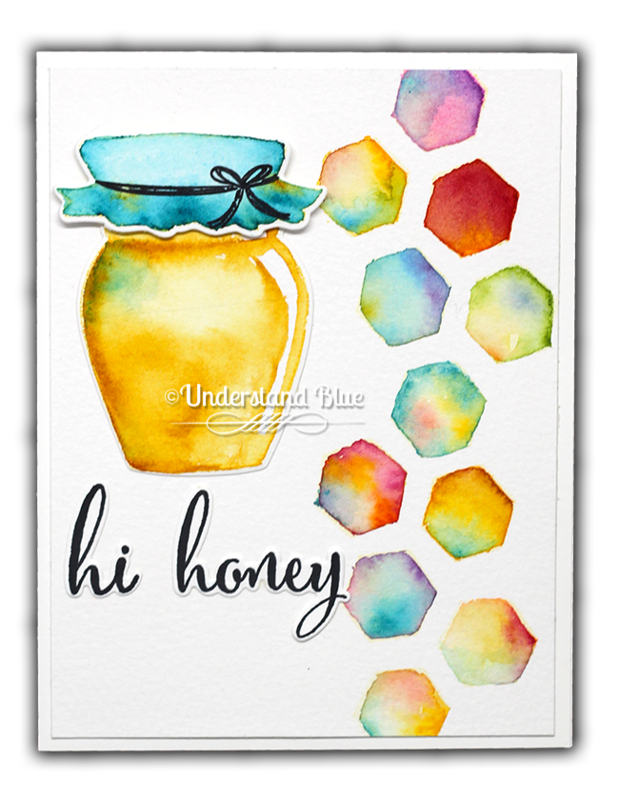 We have so much in common :-) I'm really adoring your card and the idea to use watercolor washes on the hexagons!! So beautiful how it came together!! LOVING your coloring on this card. Beautiful hexagons for sure. Very cute card! Thanks for a chance to win! What an awesome no-line water-coloring tutorial. You have certainly inspired me . Your blog is fabulous. If A Cat Is Anxious In The Forest...?